First up is Getxo International Jazz Festival . Getxo is a lovely maritime town close to Bilbao (it’s on the city’s metro line). In addition to its jazz competition for musicians under 30 – it’s bringing together top acts such as drummer Ignacio Berroa Quartet, singer-songwriter Stacey Kent, (see her video below), guitarist Al Di Meola, (video below also), top pianist plus band Gonzalo Rubalcaba Trio and the trumpet king plus band Wynton Marsalis & JLCO. Why don’t you combine a concert with a short stay in Bilbao city – the home of the remarkable, titanium-clad Guggenheim Museum. The city has terrific character and a solid reputation for fine cuisine to suit all tastes and budgets. Getxo itself is home to several of the best fish and seafood restaurants in the Basque Country. Look at our guide to Bilbao for ideas of what to see and do. Next up is the Jazz Vitoria-Gasteiz Festival. This international festival – held in Vitoria, the capital of the Basque Country – had been headlined by Spanish legend Paco de Lucia, multi Grammy-nominated Chick Corea, top saxophonist Branford Marsalis, and the young singer-songwriter Melody Gardot (see her video below) in its line-up of artists at this remarkably relaxed and laid back event. Why not combine attending the festival with a visit to the stunning Rioja and Rioja Alavesa Wine Regions only 45 minutes drive south of the city? July is a time when Rioja is at it’s ripest and most picturesque. 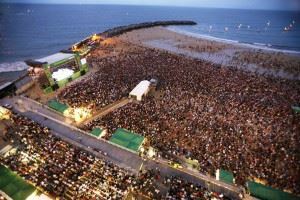 And the third Basque Jazz Festival is the San Sebastian Heineken Jazzaldia Festival. This International Jazz Festival is held in the elegant Basque city of San Sebastian that has a solid reputation among jazz fans for the quality of acts that perform here. See the likes of jazz-pop singer Jamie Cullum, singer-songwriter Elvis Costello, electronica group Belle & Sebastian, iTunes Jazz chart topping Gregory Porter, (see video below), the innovative Robert Glasper Experiment, (video link below), French/Spanish/Moroccan band Gabacho Maroconnection & the young London musician King Krule. Food lovers the world over will know San Sebastian is one of the leading gastronomic capitals of the world. The city boasts an impressive array of Michelin star restaurants such as Restaurante Arzak and Mugaritz and some amazing tapas bars too! The city’s La Concha bay is deservedly considered one of the most picturesque in the world. Check out our guide to San Sebastian for more ideas of what to see in the foodie capital of Spain. Posted in Basque Country, Bilbao, Concerts in Spain, Entertainment, Festivals, Food & Drink, Green Spain, Guggenheim Bilbao, La Rioja, Musical Events, San Sebastian, Vitoria and tagged Basque Country, Bilbao, festivals, Gasteiz, Getxo, gigs, Guggenheim, jazz, July 2013, Michelin-stars, San Sebastian, tapas bars, vitoria, wineries.